Join the discussion on our forums! 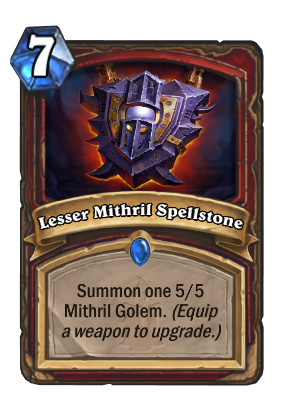 Come discuss Lesser Mithril Spellstone over in our dedicated Lesser Mithril Spellstone discussion topic. don't like this card because if you wanna make it consistent you have to include loads of weapons. 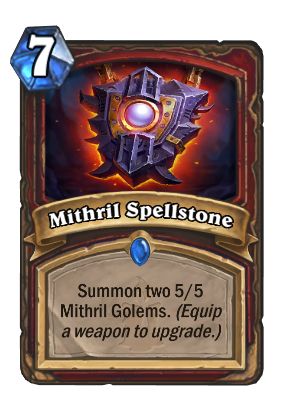 just adding 2 will make them unplayable until you have the spellstones on hand, and putting too many weapons in your deck is gonna make it hard to use them properly. if your health's too low usually you'll want to refrain from using weapons, and more so if you have a big weapon equipped and you need to drop a small weapon to activate the spellstone. This is underrated. Great card! Easiest 10/10 or 15/15 for 7 mana of my life. Great card. While it may not be that great in constructed, I love this card for winning me my first Dungeon Run against Azari. I'm curious how well this would perform in a tempo warrior deck. A 15/15 on turn 7 is nothing to scoff at. weapons summoned by minions, for example, ''n'zoth's first mate'' works? This card is amazing. Each time this lands in my hand after the mulligan, I have it upgraded to 3 golems by turn 7 the latest. Molten Blades and Malkorok trigger it, as well. Even better if you run 1 copy of Tentacle for Arms. Won me several games where the opponent could not clear all the golems (one time was close where a DK Anduin killed them, but I had both copies upgraded in my hand). I don't think this will make the Tempostorm netdecks, but for unoptimized or budget control warrior lists, this strikes me as a fine choice. Budget control warrior? What kind of sorcery is this? I think it's a solid card in a weapon themed damage deck. 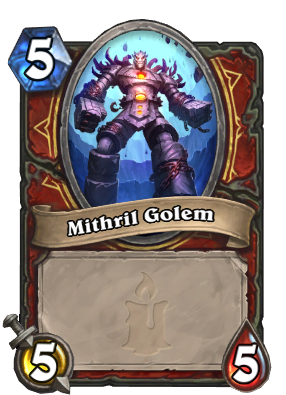 I think whether this card sees any play will depend on if a "big warrior" recruit deck will be viable. The card works well with decks that can't play small minions and it's a good way to get on board without actually playing minions. 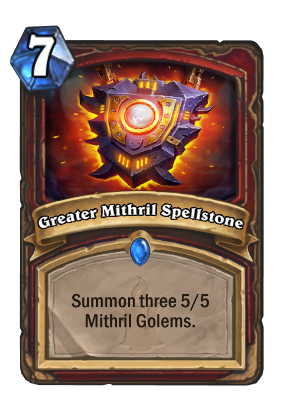 7 mana for 2 5/5 isn't great but it's good if you can upgrade it to the greater version.